November 30th and time for a Dearest Boy update. The block this time proved to be a problem. It is now obvious that the designer's template for the hexagon shape included seam allowance. Three of us participants in the sew-along assumed that it did not and used one inch paper shapes. The block was to have four hexagon flower shapes and, using the one inch papers, four will not fit. Carole had not started her block so she knows now to use a smaller hexagon paper. I set my block aside to make a decision on what to do. I do not want to re-make my flower shapes so am going to stitch down two of them as shown and just be happy with it. The group has decided to take December off from block making for the sew-along and start again in January. I finally had my "Mrs. Lincoln's Sampler" quilt machine quilted and then stitched the binding. I don't have anyone to hold it up for a photo so have taken pictures with it on the floor. Some closer pictures of the blocks. If you are interested in making your own version of the quilt, the pattern is by Lori Smith. I found it very enjoyable stitching. Here is a link to the pattern. I completed two more applique blocks for the "A Perfect Garden" quilt I am working on. First is the strawberry block and second is the apples. And a picture of all six blocks on the design wall. Those Perfect Garden blocks look good enough to eat! Your Mary Lincoln's Sampler is gorgeous. I do love Lori Smith designs and your colors are perfect! Sorry about the size mishap on your hexies. Sounds like you have all had a bit of trouble with some of the patterns and directions. Kudos to all of you for continuing. It is a lovely quilt and I do like you solution to this problem! Bummer about the hexies but I like the way you resolved it. Your sampler quilt is so lovely!! Beautiful work as usual on the applique blocks. Karen tu bloque flores hexagonal esta perfecto, buena idea utilizar dos. se ve tan limpio. Tus bloques Jardín perfecto preciosos ¿puedo elegir el de las manzanas? I think two flowers will make a nice block...a nice way to improvise. 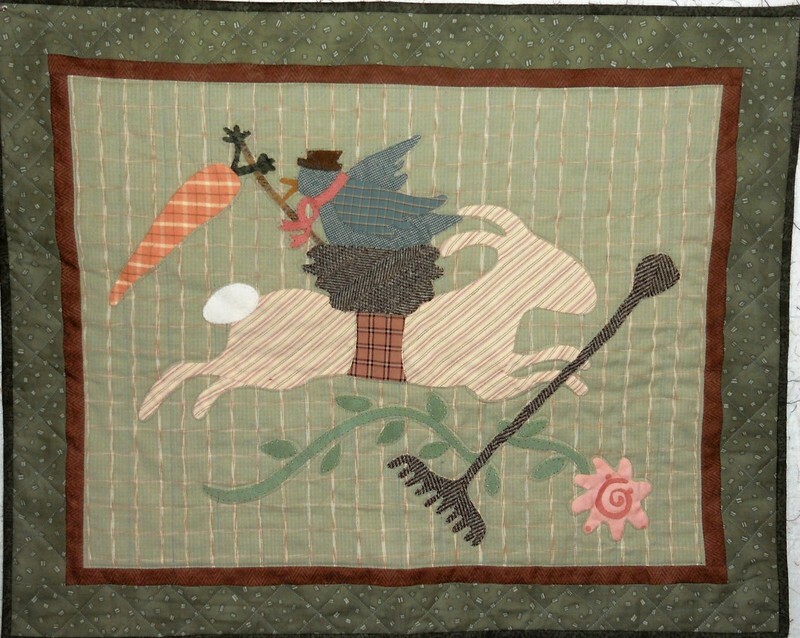 Your Mrs. Lincoln's sampler is a beautiful quilt as are your Perfect Garden blocks. Your applique' is always so nice to see. Absolutely love the Perfect Garden blocks. There is something about them that is hard for me to find words to describe, but they really speak to me! Bold and crisp aren't the best adjectives, but they are as close as I can come to what they make me feel. A nice save on the hexie block. I read the directions from Julie's post (enlarged the photo), and I don't see that there was any other way to take them, than what you all did. Love that Mrs Lincoln quilt--such pretty blocks--are you keeping this one?? Your Mrs. Lincoln’s Sampler quilt is beautiful! I believe I have the pattern around somewhere too. So irritating when a pattern omits some important info like seam allowances! A lovely finish on Mrs. Lincoln’s Sampler! Your fabric choices look like they will work beautifully into the holidays too! Frustrating when a pattern is not clear or leaves out pertinent information....while the designer may have a wonderful idea as to how the finished quilt will look, they sometimes are lacking in basic knowledge of how to write instructions clearly. Three cheers for all of you for sticking with this! Beautiful finish of Mrs Lincoln’s Sampler and beautiful appliqué. Great work! Love how your quilt came out and the quilting really sets it off nicely, without over powering the designs. You have gotten so many beautiful appliqués done, I really need to spend more time quilting this year. Oh Karen! I just love the beautiful red's in the Garden quilt. Mrs. Lincoln's Sampler is absolutely stunning and I'm sure it feels great to have another completed project. I saw where Julie had the same problem with the hexies. I don't blame you for not redoing them... they look great just like that! You did a great job on Ms Lincoln's quilt! Neat pattern. Your hexagon's look fine also. I just finished working my 1/2" hexagon flowers. Small Small! All of your work is very pretty! Sorry about the hexagons....i would think it odd to add seam allowance to a template that's usually used as paper piecing? But, the two flowers look pretty! Always enjoyable seeing your applique! OH the Mrs. Lincoln quilt is wonderful quilted. Love a newly finished quilt don't we? your applique blocks are lovely as can be. what a great red. The Mrs. Lincoln is beautiful. Bummer about the hexies, at least you didn't make a quilt full of them. Hello! I do look forward to your posts! Your Mrs. Lincoln quilt is beautiful. I love your color choices too. Your applique continues to inspire me, as I work on my first full size applique quilt. I've done smaller quilts and some with applique accents. Piecing has always been my method of choice. But as arthritis makes sewing at the machine more painful, I really love hand sewing applique & potholder style quilts more. I'm just thankful for still being able to sew, knit & create! I look forward to seeing your next blocks.